Hot and windy? 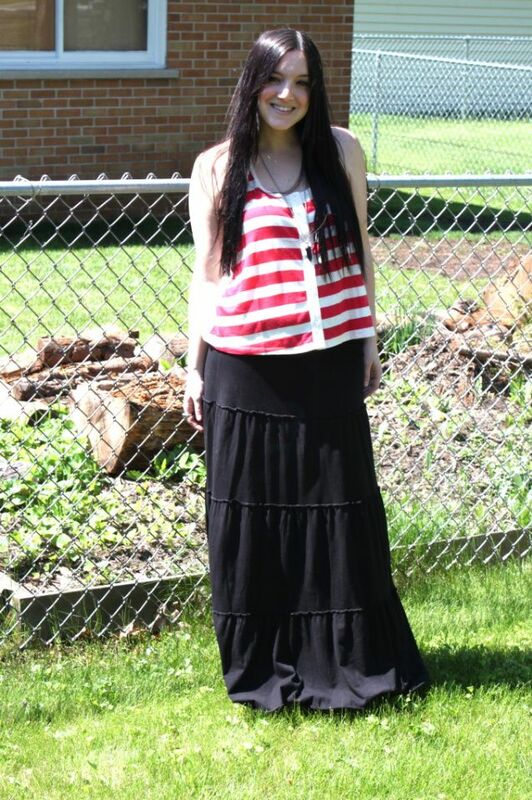 Maxi skirt and tank of course! On a different note, my hair clearly needs some work. I usually get a semi permanent gloss every 4 months and it's about that time! My hubby is pushing for bangs (as usual!) and I want to grow them out for another year! I do need a trim though, it's getting a bit wispy! Any suggestions? Style suggestions? Color suggestions? Length suggestions? I feel like a change. Nothing to dramatic (lets be honest, I'd never go super short) but something new for sure! I love the outfit....a perfect summer look! I think you'd look great with bangs - I'd totally go for it if I were you! That maxi skirt looks great! I love it all! What a fun skirt for a windy day! You always look sooooo pretty! Love that necklace, too bad it is soldout. Love your outfit!!! I never find anything that good at Express! Love your skirt! Maybe next time, you could just pick up one for me of whatever you are getting?!! How about side-swept bangs? Your hubby gets the look of bangs, and they can always pulled back easily! I just saw an older post of you with bangs and you look great. But with summer coming they might be too much. Up to you but as far as looks go I bet you would look amazing. That top is very 4th of July. Oh, I gave you an award in my post yesterday. I Love this look! You have Great hair, I am jealous! Anything you do will be Great! You are very pretty so any hairstyle will do. You look great in a maxi skirt. I wish I could pull off the look as well as you. As far as hair suggestions ... Mohawk. It's a classic. Hm, I think getting bangs again would be good. You can keep them down when it's cool and just pin them or twist them back when it's too hot and sticky. As far as the length...what about cutting off just enough to donate to Locks of Love (what is that...10 inches)? It wouldn't be "super short", but it would be enough of a change to feel "drastic". Jessi, that's a awesome idea, and I've done that before, but I just can't live without that much hair again! lol It took me 5 years to grow it back! i'm always on the fence about bangs. i love them, but when i get the itch and cut bangs, i hate them, lol. i looked at some of your older posts and you look great with bangs. i'd definitely keep them on the longer side. maybe throw in some long layers? and keep that beautiful dark color! And then I found more.. Haha. I added a "Closet" section on my blog the other day .. & I'm going to need it if I keep buying from yours!!! Love this breezy look! That tank is great! I personally love your long hair :) But that is coming from a short haired girl that wishes for long hair! My hair just never grows this long/doesn't look too hot trying. love the look! 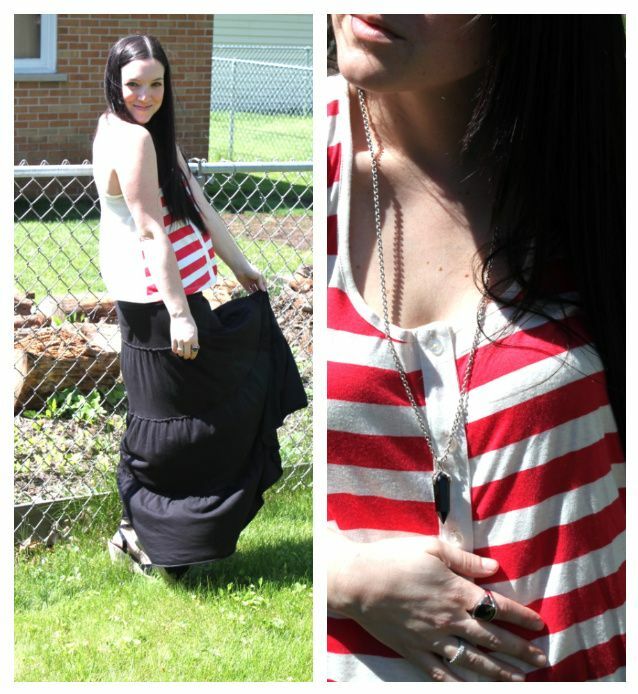 the stripes look so great with that maxi skirt! and even better that it's windy, gives your photos that cool breezy look!